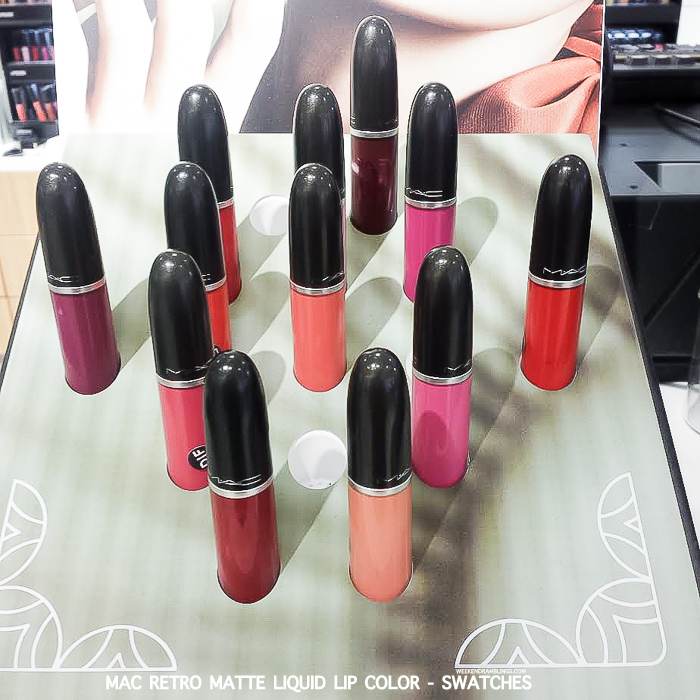 Bright colors, full coverage, and a true matte finish make the MAC Retro Matte Liquid Lip Colors perfect for anyone who likes bold colors and/or a matte finish. MAC claims these colors last 8 hours, apply evenly, and don't feather or bleed. 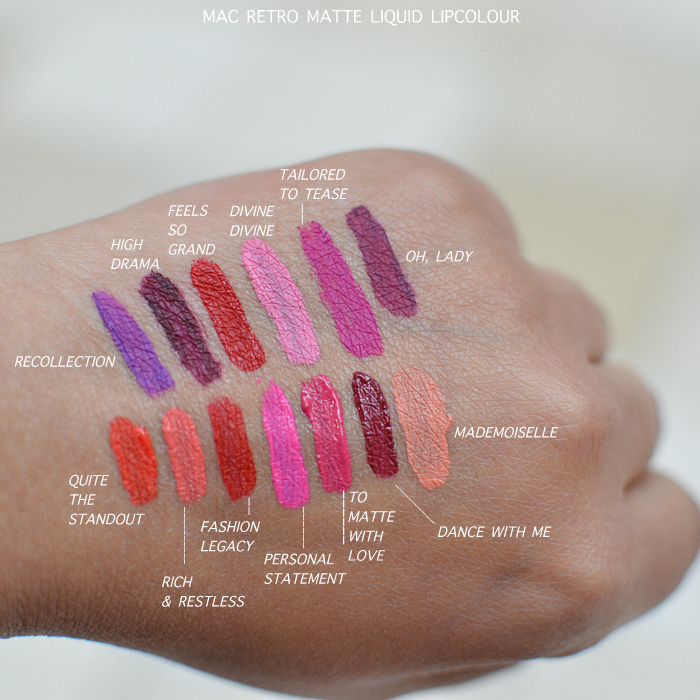 Apparently - according to the MAC SA - the colors once dry don't transfer all that easily either. While I do think they are quite longlasting (getting these swatches off my hand took quite a bit of effort), I amn't sure about the 8-hour wear time or how well they would wear/fade with time. I have extremely dry lips, and much as I love matte lip products, they never work for me. I absolutely need to have something creamy and moisturizing, and using a lip balm under matte lip colors doesn't work. That's just me, though. At any rate, I do think smooth, prepped lips would handle matte lipsticks/colors better, and perhaps the formula itself is a better pick for those with lips that aren't prone to getting dry or chapped all that fast. 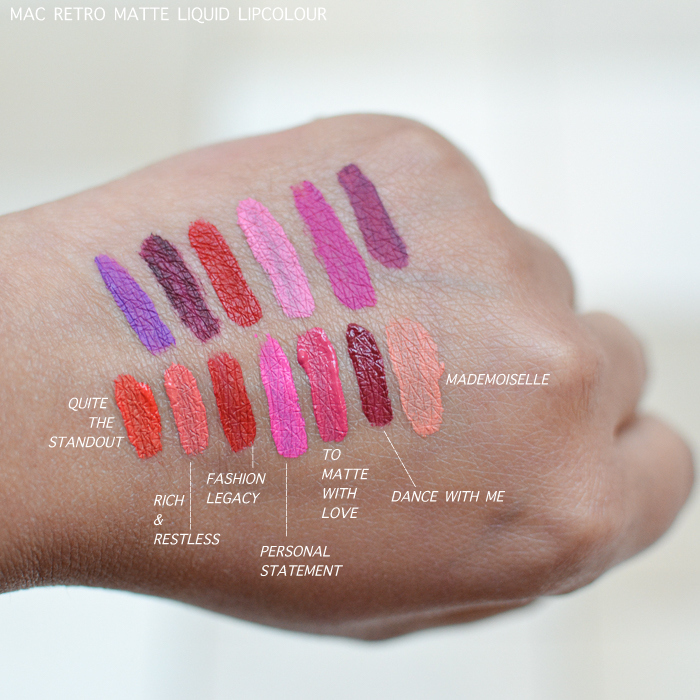 MORE MAC MAKEUP SWATCHES HERE. These are amazingly pigmented. The shade Fashion legacy is truly beautiful.